I have been using and abusing the Anastasia Brow Wiz for the longest time, so I thought that it was about time that I switch it up a little bit and try something new. I wanted to kind of venture away from Anastasia, even though I love their brow products, I just fancied a change because I have been using nothing but their products for so many years. After browsing the internet for far too long, I went with the Hourglass Arch Brow Pencil. I promised myself that this year I would branch out more into new and unknown brands because I have a tendency to stick to the same brands. This is my first purchase by Hourglass, so I was really excited to give it a go. Firstly, I have to just mention how stunning the packaging of this product is. It feels so nice and sleek in the stunning packaging. When you compare it to the Anastasia Brow Wiz it feels so much better quality wise. But, then you have to remember that they are in different price ranges. I like that it is nice and heavy because it makes it seems super luxurious. I also love that similarly to the Anastasia Brow Wiz this Hourglass Arch Brow Pencil is double ended with the product at one end and a spooly at the other. Yet again, this is another really great product for travelling with because it is an all in one solution. Now onto the product itself. I have to be completely honest and admit that I am completely in love with this brow product. Since I first bought it, I haven’t used anything but it. It is my go to product and my new holy grail brow pencil. I got it in the shade Dark Brunette, to be honest I thought it would be a touch deeper, but that isn’t a big issue. I would say that the colour of it is pretty ashy, which I prefer over it been too warm. There really isn’t one single thing that I would change about this product and I love reaching for it on a daily basis. When I first got, this I was pretty sceptical because to look at the product it looked like it would be quite a tough texture making it pretty hard to use, and I hate having to press on hard around my eyes and through my brows. 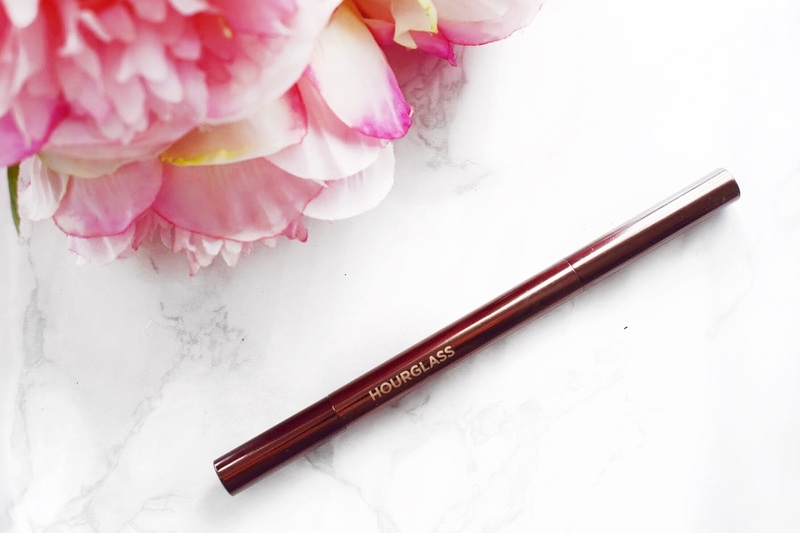 But, I genuinely couldn’t have been more wrong about this Hourglass Arch Brow Pencil. This is such a nice creamy eyebrow product and it just glides right onto the skin and through your natural eyebrow hairs so easily and smoothly. Another great thing about this Hourglass Arch Brow Pencil is the spooly on the other end. The spooly is so much bigger than on the Anastasia Brow Wiz and I love using it. I naturally have big, full eyebrows and this spooly just covers more of my natural hairs in no time at all. I have noticed such a big different in my brows since I started using this product. They look much softer and more natural. Plus, because the nib is on the larger side for a brow product it gets your brows ready in no time at all which I really love. With this, I can get very natural looking single strokes, which comes together to create a very full but natural looking eyebrow. If I did have to think of a criticism for this Hourglass Arch Brow Pencil, it would have to be the shape of the nib. If you do want to create a brow that looks very wispy and natural, it can be hard to do with this, once the nib of the product has lost its shape and rounded off a little. At the same time, I do like the nib because it is on the larger side, it gets my brows on and into place in no time at all. When I do go for a more natural looking brow where I want individual brow hairs, I just make sure to use the sides of the product rather than the very top to get the sharp lines that I want. Honestly, for me this product is perfect. It gets my brows on and into place in absolutely no time at all. It makes them look very soft and natural. The colour is perfect with ashy undertones. I couldn’t recommend this more and I am so glad that I finally gave it a go As normal with all posts here on my blog let me know in the comments down below if you have tried it and what your favourite brow products are. I will also leave a link down below to where you can find this product in case you want to check it out! Now I am hooked on it and have to keep repurchasing it! ThIs sounds lovely! It looks really similar to the ABH brow definer too and I have the same problem with the sharp edges going blunt! I really want to try the Brow Definer and it is cheaper than this so I hope I love it just as much as I do this one! I've never tried anything from hourglass, but all of their products sound incredible! They do, I can't wait to try more by them! This brow sculpting pencil sounds so lovely. There are lots of things I want to try from hourglass like their blushes and one of their bronzers. Great post. I really want to try their bronzers, they look so lovely and bronzy! I really want to try this one out!! I think it is well worth checking it out! Might try this one out next! I've been using the Anastasia Brow Definer and I adore that one! The Brow Definer is on my list to try next, I hope I love it because it is much cheaper than this Brow Arch!